Market gyrations over the last six months have provided a stark reminder that emotion and investor sentiment can be far more volatile than underlying business fundamentals. A summer of optimistic investor attitudes gave way to panic and pessimism at year end and then improved to something more neutral as the first quarter came to a close. On March 31, 2019, the S&P 500 was roughly 3% below the peak reached last September. Not coincidentally, estimated earnings for 2019 fell about 4% (from $175-180 to $167-173) as global economic growth expectations came down. It isn’t a surprise to see stock prices fall at a rate commensurate to negative earnings revisions, but the process of adjusting to a slower growing world has been more jarring than it needed to be. Just look at the S&P’s wild swing: it fell 19.8% between September 20 and December 24, 2018 and then rallied 21.4% between Christmas Eve and March 21st. Chicken Little: Back in December, I told you things looked bleak and, if you ask me, they look no better today. We still have a trade war with China, and North Korea appears to be building nukes again. Britain’s proposed exit from the EU is still a mess and overall European growth is so slow that their bonds yield virtually nothing. In some countries, you can actually get paid to borrow money (negative interest rates – see appendix)! Here at home, the yield curve inverted, and that signals recession. The sky may not be falling, but to me things look TERRIBLE! I can’t believe the market is almost back to its old high. Poplar Forest: The newspaper headlines aren’t great, but as the old saying goes, markets climb walls of worry. Besides, you left out a key concern investors had last fall: the Federal Reserve. As we said then, we were convinced that the Fed was not trying to slow the economy. The Fed has been very clear in communicating that message this year, and investors have taken it to heart. The consensus opinion is that short-term interest rates won’t rise (and might even fall). 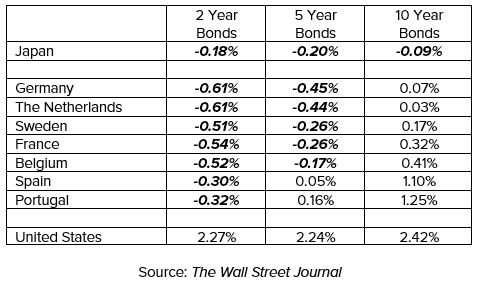 And despite intentions to let inflation run a little hotter than the Fed originally planned, low interest rates in Europe have kept a lid on 10-year Treasury rates here at home. Lower rates are economically stimulative (good for earnings growth) while also supporting higher valuations for stocks. If anything, given the fall in interest rates, P/E ratios should be higher today than they were in September, but they aren’t. In effect, relative to bonds, stocks look more attractively valued today than they did back in September. Chicken Little: But what about the inverted yield curve (when short-term interest rates are higher than long-term rates)? Poplar Forest: There is lots of discussion of the yield curve lately as an inverted curve has historically preceded recession. While it’s a good economic indicator, it isn’t a good market timing tool. We’d be happy to share the details of our analysis with you, but investors who sold at the first sign of inversion missed out on big gains in the last several cycles. Ducky Lucky: What motivated you to put all your dry powder to work last December when it seemed like everyone, including our friend Chicken Little, was panicking? Poplar Forest: Managing emotion is a critical skill for successful long-term investing. We focused on fundamentals, and everything we heard from our company contacts suggested that business wasn’t deteriorating. Meanwhile, valuations were collapsing as many investors seemed to be giving up on stocks. We didn’t know how quickly the market would recover, but we simply saw values we couldn’t resist. As you know, we believe that value – namely price relative to normalized earnings and free cash flow – wins in the long-term, and when we get the chance to buy what we think are good businesses at what appear to be great prices, we jump on the opportunity. Chicken Little: Surely you were surprised that stocks recovered so quickly? Poplar Forest: Yes. There have been 14 bear and near-bear market declines of 19% or more since 1957. In all of those cases, stocks recouped 22-70% of the decline in an interim rally before rolling over to “test” the low. The pattern has been very different this time: the market has already recouped 87% of the decline and there hasn’t been a re-test of the low. Henny Penny: I know! And my friends who watch market “technicals” are all talking about how we’ve broken through resistance. They’re telling me that when the 50-day moving average crosses the 200-day (the so called golden cross), we’ll be off to the races! Poplar Forest: That may well be the case, but we don’t put much faith in technical analysis; we’d rather spend our time working, from the bottom up, on analyzing underlying business fundamentals and valuations at the individual company level. From our vantage point, fundamentals still seem okay and the overall valuation of stocks looks reasonable — or as your friend Goldilocks might say, it seems neither too hot nor too cold, but just right. Ducky Lucky: With prices almost back to new high levels, are all the great opportunities gone? Poplar Forest: While there aren’t as many bargains today as there were in December, we have continued to find situations where we can upgrade the risk/reward ratio of our portfolios. We will talk more about that later, but the stocks we own today appear to offer great value. In aggregate, the Poplar Forest Partners Fund portfolio is priced at just 11.3x expected earnings – a 34% discount to the S&P 500’s P/E ratio of 17.0x. The discount is even greater when looking at measures such as price/sales, price/book value or price/cash flow. We don’t know when investors will come to appreciate the values we see, but we believe that our continued patience will ultimately be rewarded. Chicken Little: Are you saying the stocks you own are so cheap that they might still produce good returns even if I’m right about the world looking gloomy? Poplar Forest: That’s exactly what I’m saying. Furthermore, if the gloom starts to lift, we might see incredibly strong returns as we did in 2013 and 2016. No one can predict what the market will do in the short-term, but I really like our odds. Henny Penny: Where do you see opportunity? Should we be buying tech stocks now? Poplar Forest: For one thing, while the S&P 500 as a whole is down just over 3% from its September high, several groups have not recovered nearly as much. Oil stocks are still down 12% while financial services businesses are 11% lower and materials companies are down 9%. These three groups account for roughly 40% of our portfolio and we see potential for upside there. We sold MetLife and made an initial investment in E*Trade Financial. MetLife shares are statistically cheap, but at this point the company’s results will be dependent on macro factors, namely interest rates. We believe interest rates will rise over time and we get leverage to higher rates with E*Trade, but this new investment also offers company-specific value drivers that aren’t present at Metlife. The E*Trade management team has laid out a plan they believe will deliver $7 of earnings per share by 2023. If the company can deliver on this plan, the stock could appreciate to $105 if the shares are accorded a P/E multiple of just 15x. To put that in perspective, over the last decade, E*Trade and its closest peers, Charles Schwab and Ameritrade, were valued at P/E ratios of 19.4x, 23.3x and 18.5x, respectively. With the stock currently trading below $50 a share, we may have significant upside potential if management delivers on their plans while seeing a hopefully conservative path for the stock to exceed our targeted 3-year 15% annualized hurdle rate. We also believe that our downside is limited in that the company may be an attractive acquisition target if management doesn’t deliver. We liquidated Freeport-McMoRan and bought a small stake in United Parcel Service (UPS). Freeport-McMoRan was shrouded in controversy when we first invested in the company in 2015. Since then, the company has sold its energy assets, de-levered the balance sheet and solidified its ownership of a key copper mine in Indonesia (Grasberg). With the restructuring largely complete, Freeport shares will now be primarily driven by copper prices. While we think copper prices are more likely to rise in coming years, relying on a single macro-economic variable is a risk that we aren’t comfortable with today. Meanwhile, UPS shares have come down in price as investors grew concerned about the company’s heavy capital spending plans. We have a different perspective. UPS is spending heavily because e-commerce volume growth requires additional capacity. Some investors are concerned about Amazon getting into the business, but we believe that the delivery market is growing so rapidly that it needs heavy investment from all the incumbent players as well as Amazon. We think UPS will be able to grow earnings at a double-digit rate and that the P/E multiple will expand as they deliver solid earnings growth. We swapped the last of our Cisco shares for an initial investment in Conagra. We invested in Cisco when investors were concerned about what appeared to be a very slow revenue growth rate as the company transitioned to a subscription-driven business model. With that transition now acknowledged by investors, the shares’ risk/reward ratio no longer seems as compelling given the current 17x P/E ratio. We bought into Conagra when it was in investors’ doghouses due to the expensive acquisition of Pinnacle Brands. The stock had fallen 40% and traded at just 11x earnings and an almost 4% dividend yield. If the company can deliver on its plans for Pinnacle while also maintaining a low-single-digit growth rate in its core business, then earnings could grow 10% a year and the P/E ratio could expand to 14-15x. After the market rallied strongly in the first weeks of the year, we trimmed a few of our positions in order to have dry powder available if shifting sentiment (renewed worries of recession? higher interest rates?) brings us new opportunities. We are currently holding cash equal to about 3% of assets and we have a ready buy list should investor sentiment swing negatively again. Ducky Lucky: Having a little dry powder sounds prudent. Is there something in particular that you’re concerned about? 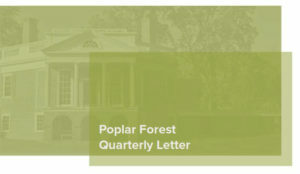 Poplar Forest: While we don’t view conditions as ripe for recession, especially given the Fed’s more dovish approach to monetary policy, we continue to be on the lookout for signs of trouble. One variable we are watching most closely at present is unemployment claims. Unemployment claims are a leading indicator of economic activity. When claims turn up, that can be an early warning sign of recession. Claims have increased from very low levels in recent weeks, but we think that may be due to the government shutdown. If we are correct in our assessment of underlying business fundamentals, then the claims data should start to improve over the next few months. That said, we will continue watching for deterioration in a list of leading economic indicators. Henny Penny: OK, that makes sense. I just got my tax refund; if I wanted to use it to add to my holdings, should I buy now or wait for another correction? Poplar Forest: That’s a tough one to answer. I know of no one who has been able to successfully and consistently predict the market in the short term. We believe that the market is at least 80% right, 80% of the time. That does leave rare occasions, like last December, when investor sentiment is sufficiently extreme as to allow one to make a tactical call on the market. But, we don’t think this is one of those times. We think the best course of action is to stick to your long-term allocation targets and to rebalance if anything has gotten away from those targets. We’re firm believers that time in the market is more important than timing the market. Developing a long-term plan, and sticking to it – especially when those around you are either enthusiastic or depressed – is a key to long-term wealth creation. Our plan is to focus on companies that we’d be comfortable owning for years and investing in them when other investors underappreciate or undervalue the long-term prospects of those companies. Against the backdrop of a relatively balanced market outlook, the heavily discounted valuation of the stocks in our portfolios has them looking unusually attractive right now. For investors with a long-term horizon, owning good companies at a big discount to the market may provide real opportunity.